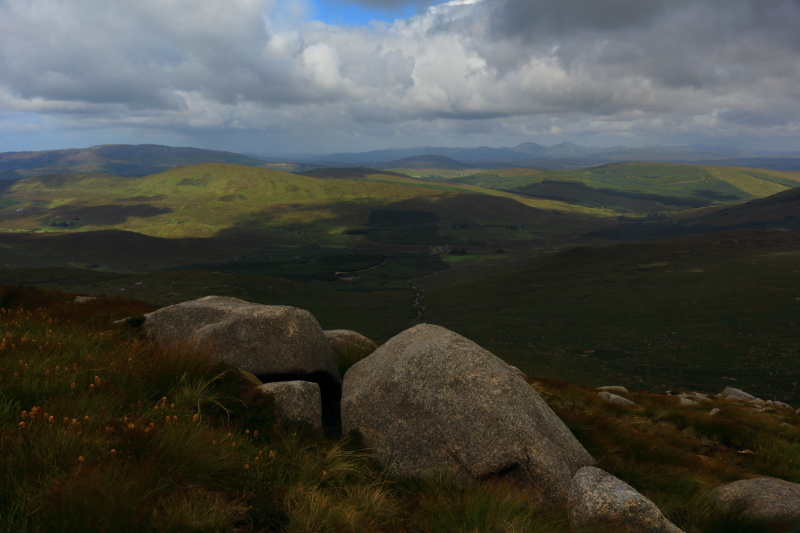 On the way up Ardnageer, looking towards Croaghbane. 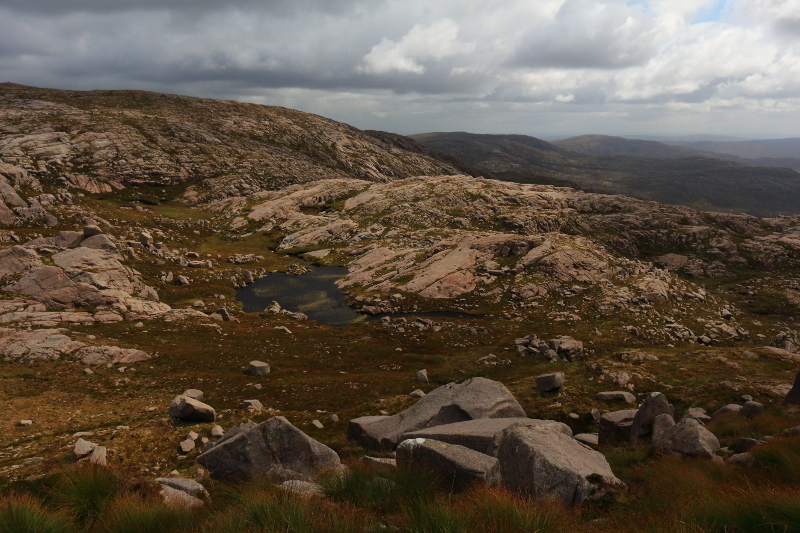 Since taking up hill walking, I have become enthralled by the Bluestack Mountains range, and have walked many of its peaks. 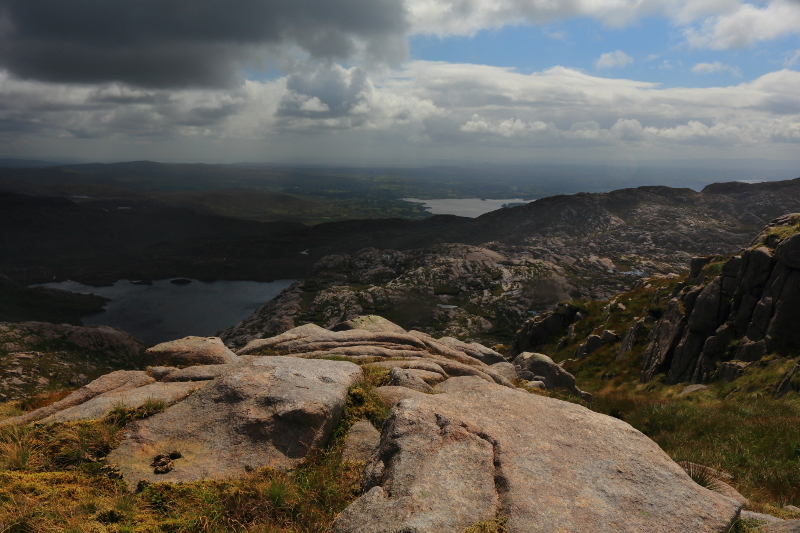 However, I had yet to stand on its highest mountain, Croaghgorm. Part of the reason is that Croaghgorm is in the middle of a ridge of mountains, also containing some of the other highest peaks in the range, and one of the best routes is to approach via Croaghbane, Ardnageer, Ardnageer SW Top, and then having reached Croaghgorm, continue on to Lavagh More and Lavagh Beg, before taking the long walk back to the starting point in the Reelan Valley. 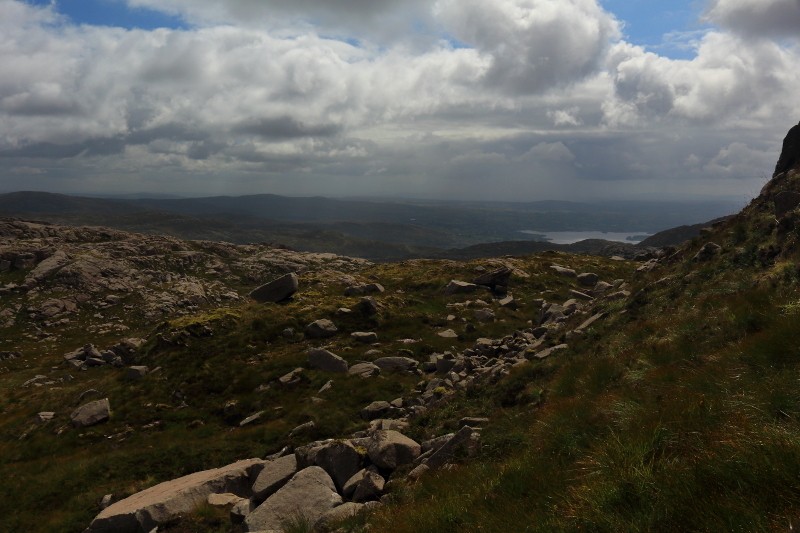 I had set out to do the walk before, but after reaching the summit of Croaghbane, I was driven back by terrible weather. I had seen the entire route that day however, and it looked dauntingly long. Now, bouyed up by having Ireland’s highest mountain, Carrauntoohil under my belt, I decided to have another go, waiting for a day when good weather looked more likely. I started at the same spot in the Reelan Valley, and initially took the same route as on my previous attempt, heading up Glascarns Hill. 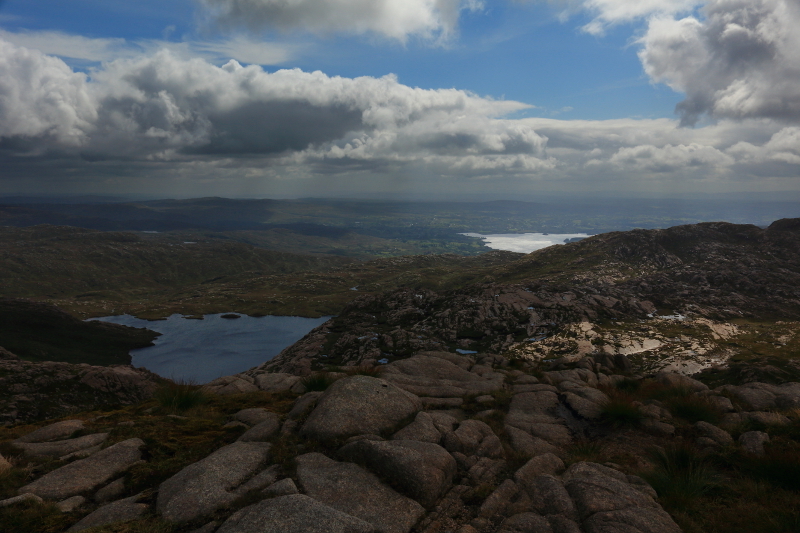 However, i had summited Croaghbane before so I decided to shorten my walk on this occasion, figuring it would be long enough, by skipping Glascarns Hill and Croaghbane. 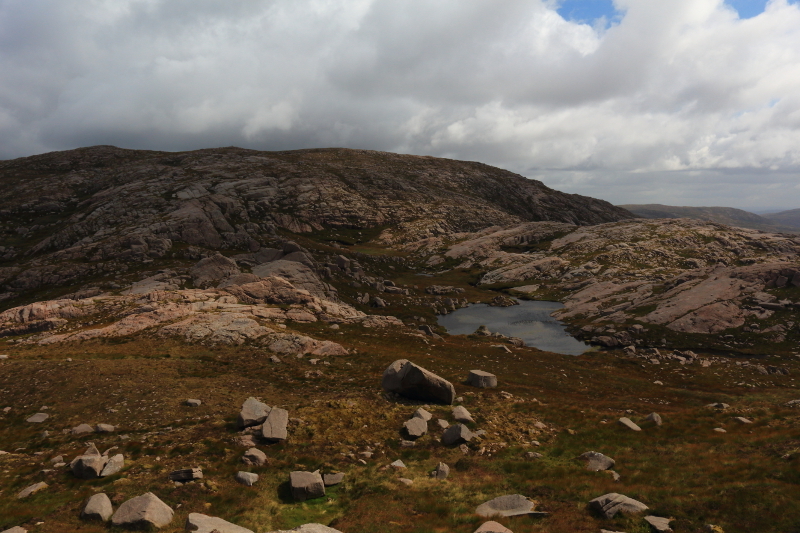 This part of the walk was also over tiring, difficult terrain, boggy, with high tussocky grass. So, having gained some height, I cut off Southwest crossing the Effernagh River, high up where it was merely a trickle, and made directly for Ardnageer. I paused just short of the summit, taking a breather before the last steep section. Just before the last steep section which would take me to Ardnageer’s summit, looking south. 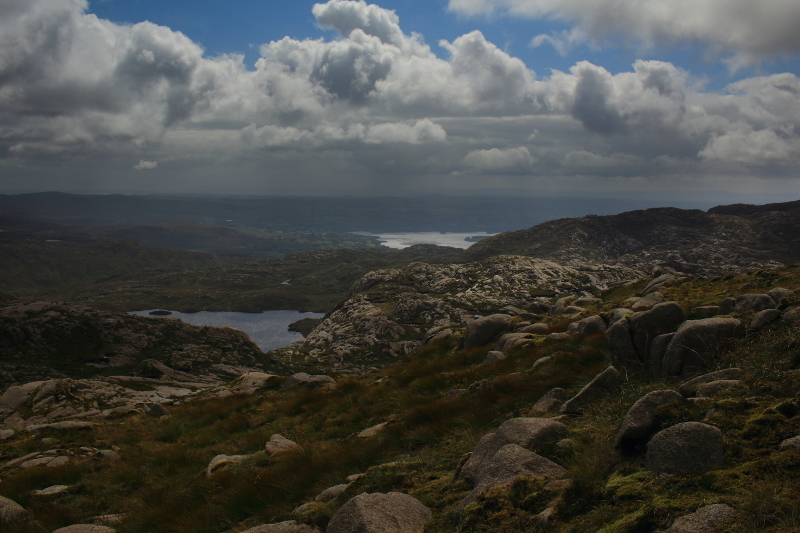 A glimpse of Lough Belshade, with Lough Eske beyond. The final climb was steep, requiring the use of hands to scramble up to the summit area, a broad, rocky top. Looking back to the Reelan Valley. 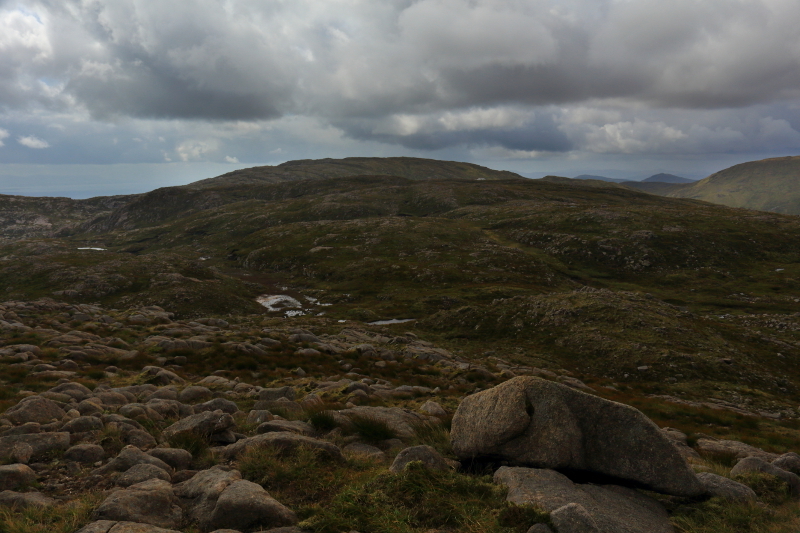 Having reached the top of Ardnageer, at 642m, most of the height on the walk had already been gained, and the next few peaks were all part of a ridge, with not too much descent/ascent between them. The next peak, Ardnageer SW Top required little climbing down and back up again to reach, and many guides do not even consider it a separate peak. I was happy to however, as another summit makes my days walking sound much more impressive! 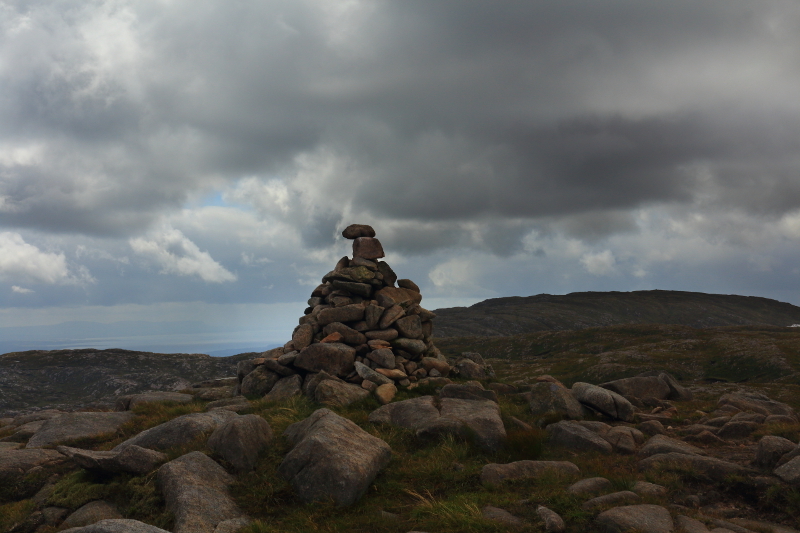 The next summit on the walk, Ardnageer SW Top. 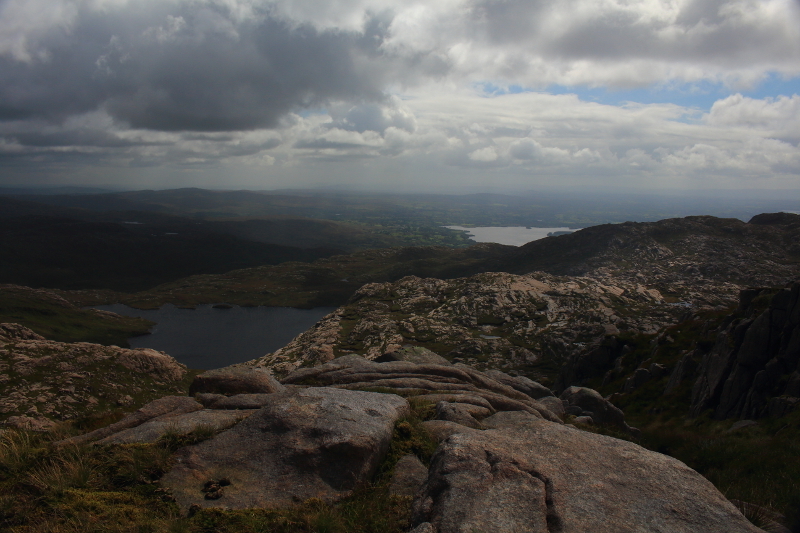 One peak bagged, and I stil felt full of energy despite some difficult ground and steep walking to reach Ardnageer, so I continued southwest across rocky terrain, dotted with little loughs and pools. 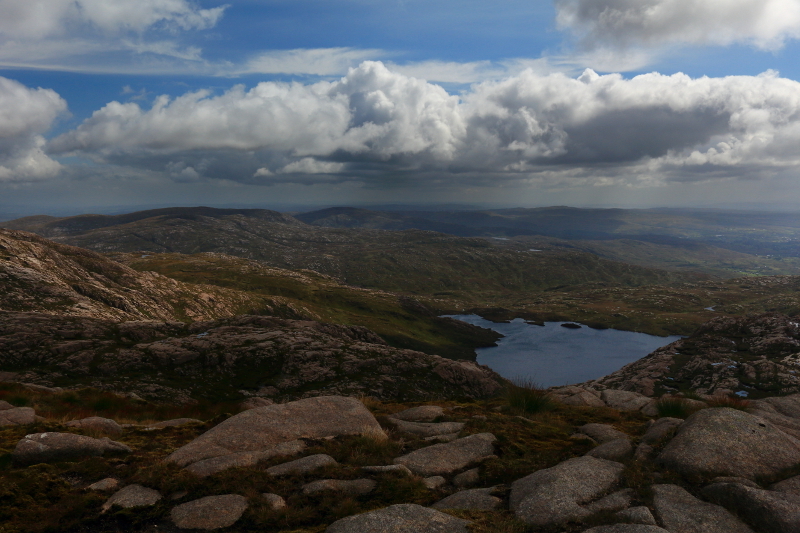 In my next post I’ll cover the next summit, Ardnageer SW Top. 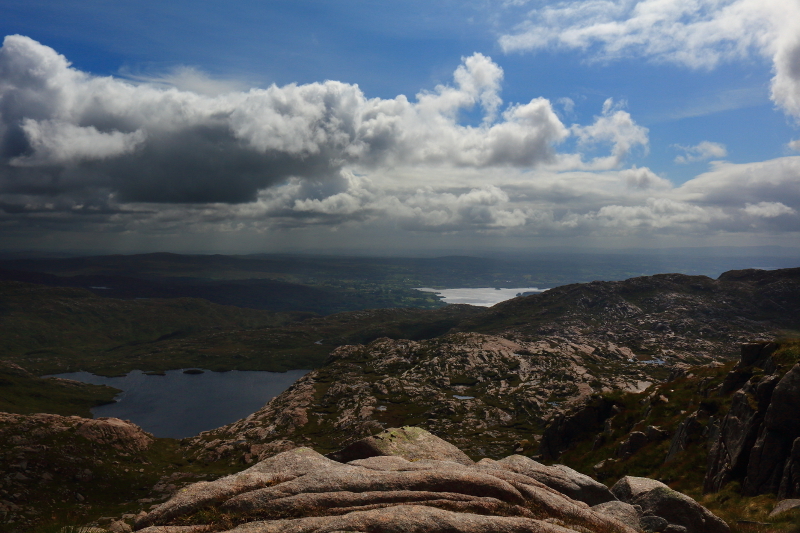 Posted in Landscape, Nature, PhotographyTagged Ardnageer, Ardnageer SW Top, Bluestack, Bluestacks, Croaghbane, Donegal, hill walking, Hillwalking, Ireland, Lough Belshade, Lough Eske, Mountain, mountainsBookmark the permalink. It must be a great feeling to reach the summits of these peaks – exhilarating and very satisfying – and to have such wonderful photographs to commemorate the achievement. 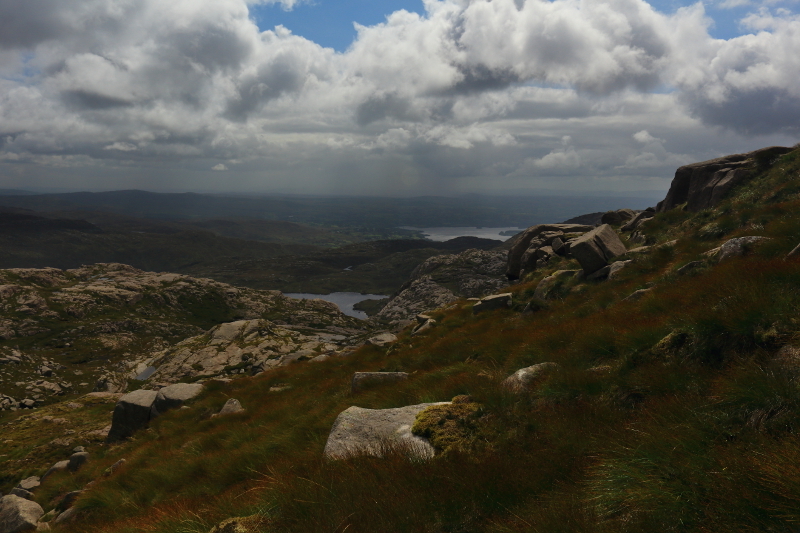 It is nice to be able to look back on these walks when I can’t get out, and I was particularly pleased with this walk as the Bluestacks are close to my heart. 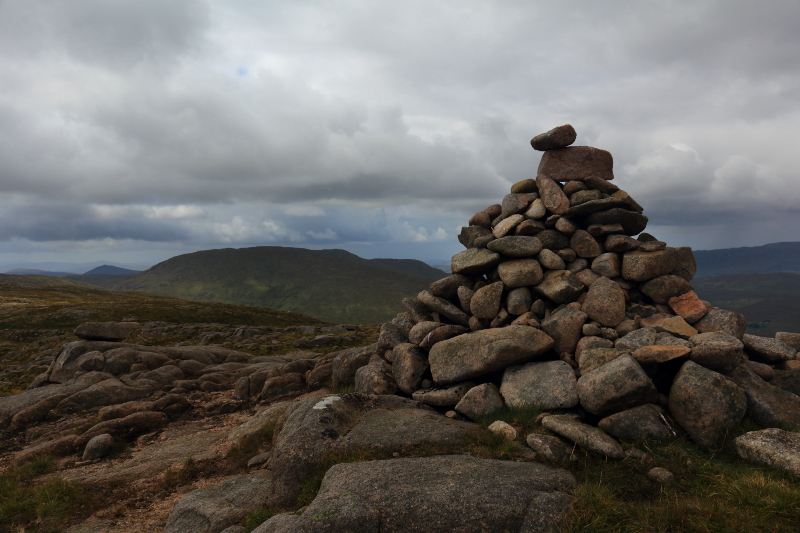 The next mountain in this walk, Ardnageer SW Top, has an unusual geological feature which might interest you (next post).